Michael is sometimes quite patient with me. He lets me feed him things that I like and he doesn't necessarily love, and meanwhile I rarely make him things he wants that I don't like (like tacos). Every now and then I have to throw the boy a bone. 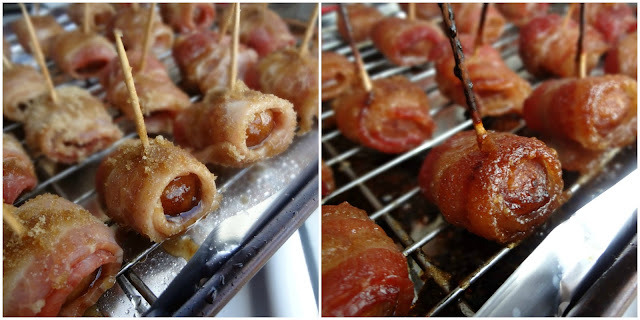 This time, that bone was these bacon wrapped water chestnuts. 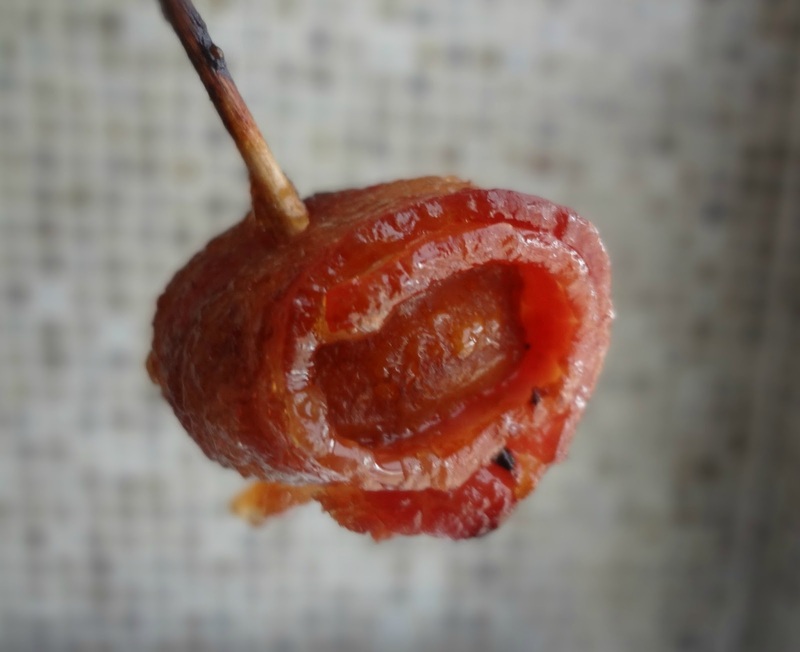 When we were home for Christmas, at his dad's house, his stepmom (Jeanne)'s sister-in-law-type-person made some bacon wrapped water chestnuts. And Michael would not shut up about them. He was all "If you made these for me I wouldn't be mad." 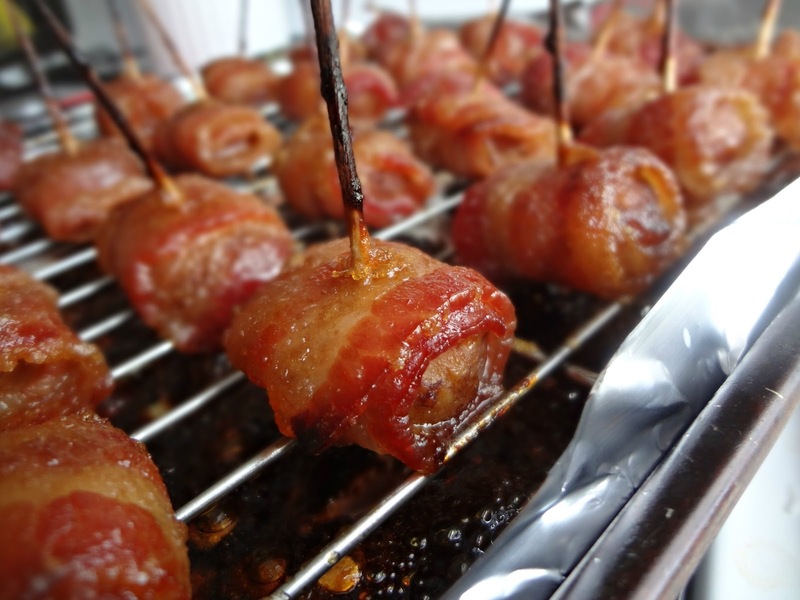 and later, "Ahhh remember those bacon wrapped water chestnuts? I miss them." and the less subtle "MAKE ME THEM, WOMAN!" (ok...maybe these aren't direct quotes). Anyway, one day I saw a recipe for his obsession on The Girl Who Ate Everything and I said, "Hm, you'd like it if I made these for you, huh?" and he looked at me like a puppy dangling a treat in front of his nose. Then it was just a matter of time. 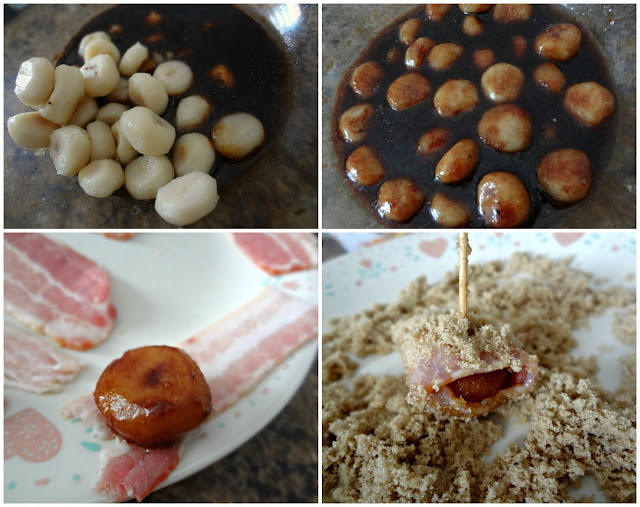 In an attempt to raise his spirits on Easter (since we are in NYC and not with our families) I made him these bacon wrapped water chestnuts. So see, make these and you and your loved ones will be happy. Proven fact. In a medium bowl whisk together the soy sauce, vegetable oil, ketchup, vinegar, garlic, and pepper. Add drained chestnuts into the bowl and mix. Cover and marinate in the refrigerator for at least 4 hours. Preheat oven to 375 degrees. Line a cookie sheet or 9 x 13 pan with foil or parchment paper and place a metal rack on top or use a broiler pan to let drippings fall off. Spray the broiler pan or rack with non-stick cooking spray. Cut the bacon strips into halves or thirds (depending on the size of the bacon). Drain water chestnuts from the marinade. Roll each chestnut in each of the cut pieces of bacon, securing with a toothpick. Coat in brown sugar. They're sorta cute, aren't they?